Hello! 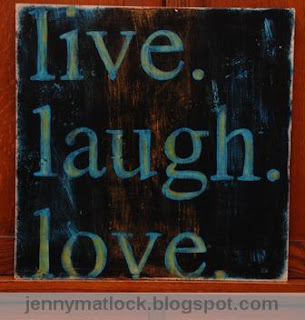 I haven't been too lazy this week so I have three "L" signs to share! Thanks for lingering a little bit here! To visit other links to the letter "L", just click here. I like these! Not being native English spoken (is that even correct??) I always like to read / hear sayings and see if there is something comparable in German. Gotta check out your other letters. I love the bottom one! such a great slogan, and the writing is absolutely gorgeous. All I can say is...AMAZING!!! You are so humble with such talent. Live, Laugh, Love!! Great words for the heart my friend. Well done as always. Very nice again, Jenny! You draw soooo good!!! My favorite, both for the message and for the art work will be the 'Life is like a Bicycle." I can barely remember learning to ride but I do remember the day I got it. Dad went down to the train station and got this huge package from Sears. You just get better and better at this! So what the heck are you going to do with them all? These are amazing! I wish I could letter like that! Those are great 'Ls' Jenny! I am still working on my L post and with any luck will get it up before it's time to link to M!! You are impressive! One day I will be as talented as you. One day. That is amazing. And I love the bicycle one. That's exactly my way of thinking ! I just love that second sign! Truly those are the important things in life. Alphabet" , beautifully and done with much love. YOU GO GIRL!!!! I like the bicycle quote, it's just perfect . Positive signs all♫♪ Love your work! Again...as always! Love them! You are amazing! Love that last one. 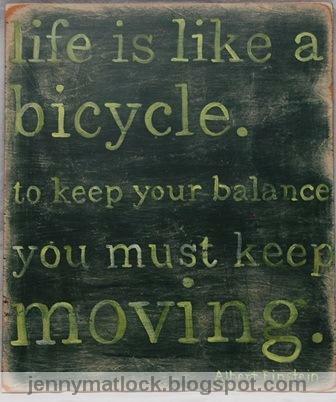 It is true, you can't keep your balance on a bike unless it is moving. I love it!!! You do great work. Isn't it true? When we tend to stop 'moving' (as in trying, doing, learning, caring) we do find outselves out of balance. Great sign for a meditation or exercise room! I am just loving your signs, Jenny! What are you doing with all of them? another great set! I really like the bicycle imagery! So Mrs. Jenny...are you selling these? Do custom ones? They are gorgeous painting, Jenny! Sorry for the late visiting..